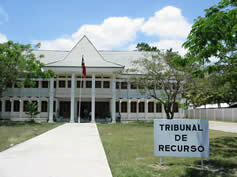 The international criminal tribunals confront severe impediments to accurate fact-finding. 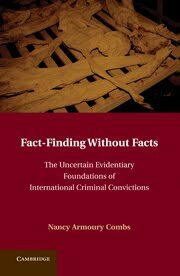 The challenge of that fact-finding process is the subject of my book, Fact-finding Without Facts: The Uncertain Evidentiary Foundations of International Criminal Convictions, published just days ago by Cambridge University Press. The book is summarized in an article I contributed to a 2009 symposium edition. The basis for my study is a large-scale review of transcripts from the International Criminal Tribunal for Rwanda, the Special Court for Sierra Leone, and the Special Panels for East Timor (below left). (photo credit) This review demonstrates that many international witnesses are unable to convey the information that court personnel expect – and need – to receive if they are to make reasoned factual assessments in which we can have confidence. ► They frequently pertain to core features of that testimony. In particular, my review of all of the completed Sierra Leone Special Court cases and a handful of the Rwanda Tribunal cases shows that more than 50 percent of the prosecution witnesses appearing in these trials testified in a way that was seriously inconsistent with their pre-trial statements. Sometimes the inconsistencies related to such details as the date, time, or place of the crime, but as frequently they related to such fundamental matters as the nature of the crime and the nature of the defendant’s involvement in the crime. ► Limitations on witness capacity: Many witnesses lack the education and life experiences to be able to read maps, tell time, or answer questions concerning distances and dates. Cultural norms and taboos create additional communication difficulties, as some witnesses are reluctant to speak directly or at all about certain events and as international judges inappropriately assess witnesses’ demeanor and willingness to answer questions by Western norms. The need for language interpretation for virtually every fact witness and the unfamiliarity of most witnesses with the predominantly adversarial trial procedures used at the international tribunals only compound these problems. ► Witness mendacity: Educational, cultural, and linguistic factors likely cause many of the inconsistencies and other testimonial deficiencies that pervade international trials, but witness mendacity provides an equally plausible explanation. Indeed, my review of ICTR cases shows that more than 90 percent of cases that went to tr ial featured an alibi or another example of diametrically opposing testimony from defense and prosecution witnesses. Although some of these witnesses may be honestly mistaken, the use of alibis and the incidence of contradictory testimony so vastly exceeds that which is common to domestic trials that it would be naïve to dismiss a substantial portion of it as arising from honest mistakes. These empirical findings lead me to conclude that international criminal trials are less reliable adjudicatory mechanisms than they appear. But, the fact that international tribunals have considerable difficulty determining who did what to whom does not necessarily call into question the legal accuracy of international criminal judgments. What matters for that question is the way in which the Trial Chambers respond to the testimonial deficiencies that pervade their trials. 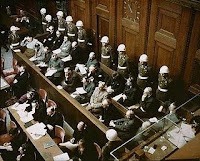 Comparison between witness testimony and the Trial Chambers’ description and treatment of that testimony led to the discovery that, as a general matter, the tribunals take something of a cavalier approach to fact-finding impediments. Many testimonial deficiencies are never mentioned in the Trial Chambers’ judgments, and most of those that are, are reflexively attributed to innocent causes that do not impact the witnesses’ credibility. So, why do the Trial Chambers seem so unconcerned about testimonial deficiencies? In my view, the Trial Chambers’ cavalier attitude derives most directly from principles of organizational liability that appeared in Article 9 of the 1945 Charter of the International Military Tribunal at Nuremberg. These organizational liability principles were ostensibly discredited during the Nuremberg Trial (right), but they continue to exert a powerful influence over fact-finding at today’s international tribunals. Indeed, if the Trial Chambers appear largely unconcerned about testimonial deficiencies, it may be because the testimony itself is not the exclusive basis for the Trial Chambers’ factual determinations. The Trial Chambers appear to be convicting defendants on the basis of the acts charged in the indictments and basing their factual findings about those acts solely on the testimony that has been presented to them. In fact, however, the Trial Chambers supplement that testimony with inferences that they draw from the defendants’ official position or institutional affiliation in the context of the international crimes that have been committed. ►► Certain otherwise inexplicable acquittals. In short, because objective or reliable evidence is so difficult to come by in the international realm, Trial Chambers rely on official position or institutional affiliation as a proxy of sorts for the defendant’s involvement in the crimes. Prosecutors must still present some evidence to support the specific allegations appearing in the indictment. The stronger the inferences that can reasonably be drawn from official position, however, the more that Trial Chambers are willing to overlook problematic features of prosecution witness testimony or attribute those problems to innocent causes. Will the fact-finding impediments, if they persist, fatally undermine the work of the international tribunals? Various ways of justifying international criminal fact-finding are addressed. The primary focus, though, is on how the evidence presented at the international tribunals interacts with the applicable standard of proof. Particularly explored are modern scholars who view beyond a reasonable doubt as variable standard that signifies -- and should signify-- different levels of certainty in different cases. I conclude that this understanding of the standard of proof not only affords an alternative explanation for international criminal fact-finding, but also provides a solid and satisfying justification for it. This is all very interesting and helpful for practitioners, I look forward to read the book. It seems that your research did not include ICTY. Why? Do you think that the same issues have affected the quality of testimony at ICTY? What do you think, for example, about the acquittals of the Kupreskic in appeals or the acquittal of Vasijljevic for some charges because quite strict requirements of reliability?